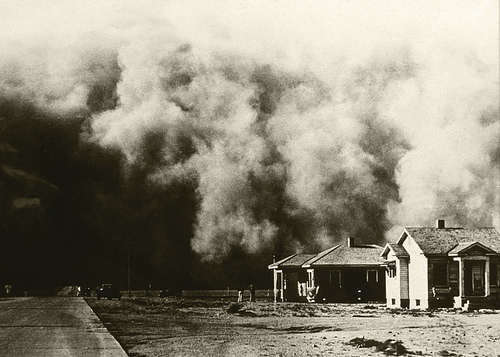 In the early 1930s, amidst the greatest depression our nation has ever experienced, came an equally unparalleled environmental disaster known as the DUST BOWL. Following a severe and sustained drought in the Great Plains, the region's soil began to erode. Mixed in with strong winds, this sediment created huge black dust storms that swallowed the countryside. The massive storms reached across the nation; south to Texas and as far east as New York. On Capitol Hill, while testifying about the erosion problem, soil scientist Hugh Hammond Bennett threw back the curtains to reveal a sky blackened with dust. Congress unanimously passed legislation declaring soil and water conservation a national priority. Nearly three-fourths of the continental United States was privately owned in 1937, so President Franklin Roosevelt wrote the governors of every state recommending legislation that would allow local landowners to form soil conservation districts. The movement caught on across the county and we now boast nearly 3,000 conservation districts dedicated to conserving our natural resources. Photos and historical information courtesy of the National Association of Conservation Districts and the Natural Resources Conservation Service. Hugh Hammond Bennett led the soil conservation movement in the United States. During the Dustbowl he urged the nation to address soil erosion. On his recommendation, a new federal agency called the Soil Conservation Service (now the Natural Resources Conservation Service) was created to combat soil erosion hazards. "If we take care of the land, it will take care of us."